..WATER STATUS UPDATE as of January 28, 2015..
Today, the Butuan City Water District has operated the by-pass line created to supply water from the Taguibo River. The by-pass line was commissioned for temporary usage while BCWD continues with the rehabilitation of the Infiltration Gallery. With the operation of the by-pass line, water from the Taguibo River can now be processed in the Filtration Plant. 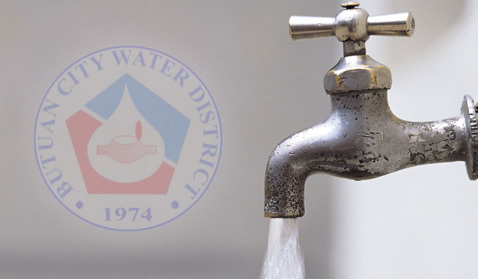 The much needed water supply can now be provided to BCWD's concessionaires. However, since the power source used for the by-pass line is only a generator, the operation of said facility will be suspended every 10 in the evening up to 4 in the morning. Please bear with us as BCWD continues with the rehabilitation works. A simple reminder to our concessionaires to please check your faucets if there are still those that are open. This is just to avoid water wastage in case normal water pressure will return.